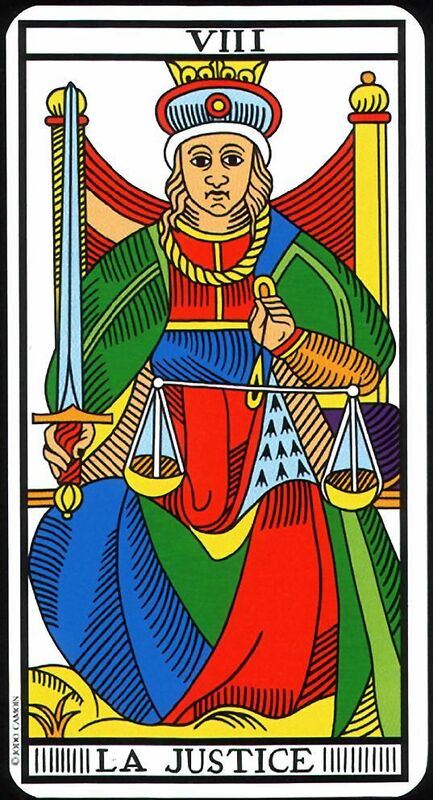 The perfect card for the Fall Equinox for me is the eighth card in Le Tarot de Marseilles or Justice. 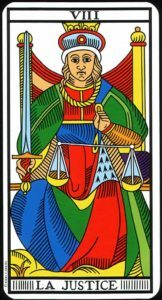 The scales and the sword evoke a feeling of leaves falling in the Northern Hemisphere and the descent into colder weather as shown by the ermine triangle in Lady Justice’s robe. 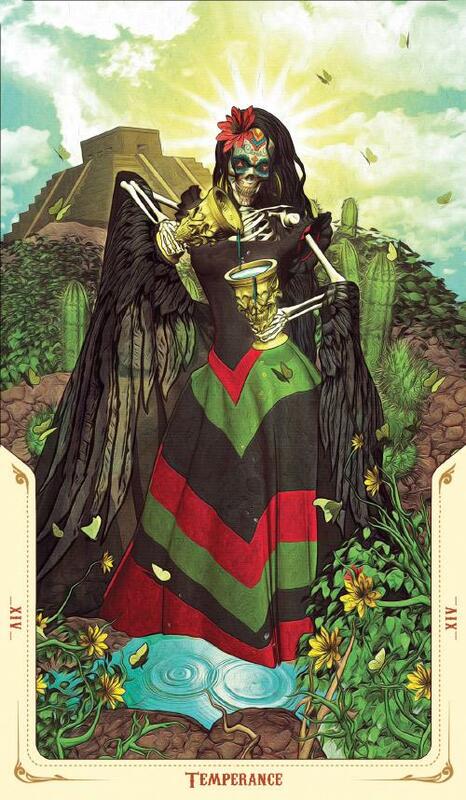 In the Camoin-Jodorowsky Tarot, Justice is forward facing and wears no veil. She is an observer. Most Tarot readers forget the different numerical order in the Marseille styled decks. The number 8 is the same figure as the leminscate when turned on its side. It reminds one of eternity or the eternal return. It is a looped ribbon. Most switch the words eternal and infinite but they are quite different in concept. What is infinite is stretched out endlessly, or without end. What is eternal is enduring as it is repeated over and over. It is phenomena which can be seen, evaluated and weighed on Justice’s scale. What is eternal has a beginning and an ending point which the sword reminds us of in the right hand of the central figure. More modern minds might see an eternal return as a feedback loop, with a beginning midpoint, and ending; which then rewinds to start over again. “Turn and return”. The cycle of birth, death and rebirth may have emerged from Northern agro-cults as they observed the life of trees, crops and seasons. To find the Devil card in the Lenormand deck we have to go back to an earlier post in the blog on the traditional seven Dark Arts cards. Among them are listed two animal cards the Fox and the Hound/Dog. In the occult traditions the Black Jackal Anubis is messenger and psychopomp, a leader of souls into the Afterlife or the Underworld. In terms of human traits the Dog is the symbol of loyalty and denotes a follower. The paramount follower in terms of occult anatomy is the human shadow. Neither of these concepts are themes of the Devil. The Fox is a traditional lenormand symbol of the Devil primarily in German card lore. Its color is usually red. It wears a mask. It is used in the Protestant biased culture to represent that which is wrong or false. However, one must set folklore to the side and look at the Greco-Roman influences on culture and religion also. The Snake symbol was the totem of the Pythia, the Elder female oracles in Greece who were descendants of the matriarchal lineages of ancient African Python divination cults. The Snake was a Holy Icon represented in spite of its linear shape as feminine wisdom in a female mystery system. At the point in time when “femaleness” became intolerable to the Church of Rome, the falseness of the Red Fox or the Old Devil was upgraded to cunning by the Patriarchs and the whispered wisdom of the old eared Serpent demoted to evil, along with the female gender as a whole. The clergy whether Catholic or Protestant prefers to promote the symbology of the right facing domesticated Dog to represent the outward role of the male clergy to the masses as that of a protective benign guide, while denying the roots of the Dog symbol as an update to the Jackal- a predatory scavenger! The Fox’s shift from a symbol of falsehood or lies to a representative of quickness of mind and cunning by the Patriarchs was done because they admired and themselves used intelligence and trickery to gain, hold, and control power. In Germany, where a Protestant state of mind ruled, their Devil remained filed under the details of the Red Fox as the Serpent retained the maternal qualities and wisdom attributed to Mothers and other older and wiser women. The Fox and Serpent cards are double cards in the traditional lenormand style deck. This means they have values associated with their directions, i.e. pairs made on the left side are inauspicious while pairings on the right side of the same card are auspicious or benign. Note in the traditional Blue Owl deck example shown above both Fox and Serpent face left as does the female Querent card. Facing left in cartomantic language is a way of denoting feminine energy and traits, which in a male dominant hierarchy are by their very nature- rebuked. 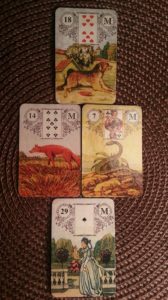 New students of the lenormand method at the beginning stages do not learn direction when reading the cards. They also in general do not take into account the doubleness of the signs. The beginner who is self-taught from a variety of books will also tend to mix information from the various European cardlore in their attempts to find core meanings for single cards. These factors may account for meanings which have bled into one another and blurred in both the Fox and the Serpent cards in terms of their linking to negativity, evil or the “Devil” and by extension their association with femaleness. Along with the rediscovery of Lenormand in the States came artists who drew the lenormand symbols with no prior knowledge of the traditions the cards emerged from based solely on a superficial overview. This makes the choice of a proper learning deck crucial for the serious student of Cartomancy.